Woodland Scenics R.R. Gothic White Dry Transfer Decals. FEATURES: Apply easily to smooth or textured surfaces. Add desired detail to buildings, fences, signs, and box cars. No decal film to spoil the look of your models. This is A Bag of Woodland Scenics Coarse Talus (Gray). FEATURES: Extremely realistic looking rock debris. Woodland Scenics Clump Foliage was Designed for Multiple Uses on Your Layout. This is a Bag of Light Green Color. FEATURES: Use for bushes, shrubs, large ground cover, and tree foliage. Specially produced, clumped ground foam ideal for multiple uses. look in large ground covers. Pieces can be broken into smaller pieces. Different colors may be mixed for a more realistic look. May be used to cover seams between buildings and terrain base. Instructions for ground cover and trees printed on package. FEATURES: These culverts are cast in high-density Hydrocal. This is A Bag of Woodland Scenics Fine Talus (Buff). 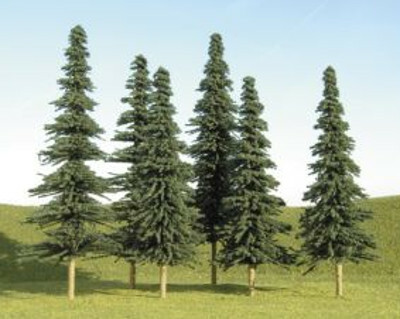 in Conifer Colors for Model Layouts from Woodland Scenics. Woodland Scenics R.R. Roman Red/Gold Dry Transfer Decals.